Isaiah 41:10 is a great example of the encouragement found within the book of Isaiah. The book of Isaiah is filled with so many countless encouraging verses, which all reflect on the power and love and providence of our Lord God. “Fear not, for I am with you”: God is always with us. He is with you, day and night, no matter what you’re going through. That’s a promise! I love in the first part of verse 10 how we are commanded to “Fear not,” because God is with us. What a promise! What an encouragement! We have no reason to fear, because God is with us. “Be not dismayed, for I am your God”: Dismay is another word for distress, usually instigated by something unexpected. 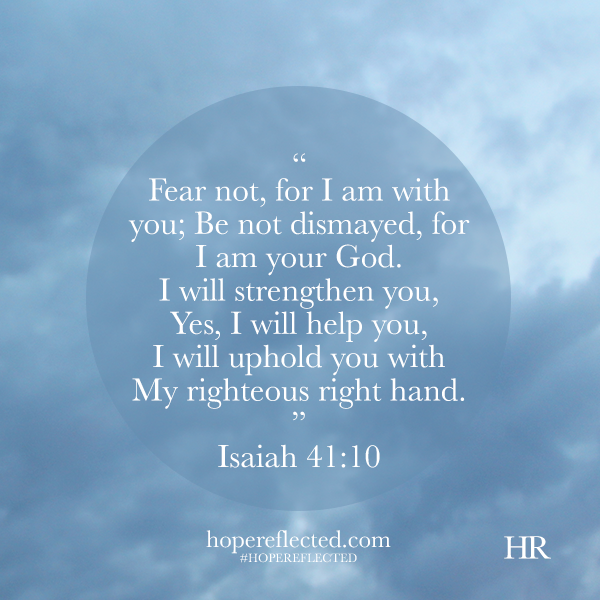 In Isaiah 41:10, we are encouraged to be not dismayed. Why? “for I am your God”. We serve the Living Christ, Who conquered death for us, so there is no reason to be dismayed. This is something I need to constantly remind myself of, especially when life throws curve balls my way. “I will strengthen you, yes, I will help you”: God promises to provide us with strength, and with help. When you’re feeling like you can’t go on or you just don’t know how you’re going to get through the day, God will be right with you to provide you with the strength and help you need, to get through whatever you’re facing. “I will uphold you with My righteous right hand.”: God promises to uphold us. More than that, He promises to uphold us with His righteous right hand. That means, when you lose your footing, He’s going to be there to hold you up, if you’ll trust in Him. What I love about this verse, is that we are told God will uphold us with His righteous right hand. Righteous: Pure, virtuous, upstanding, ethical, honest. Regardless of your circumstances, God is righteous. And He will uphold you with His right hand. His right hand! Throughout scripture, God’s right hand is mentioned several times. Historically, to be put on someone’s right hand is to be held in equal honour. God’s right hand also symbolizes His power and His greatness. Whatever you’re facing this week, remember Isaiah 41:10 and claim it for yourself! HALLELUJAH! This devotional is POWERFUL! It’s God’s Personal promise of help to his children!! Thank You!